From then on go to the website of NFL Game Pass or use their app if supported. Please see supported devices between NFL Game Pass and Unlocator at the bottom of this page. The US NFL Game Pass does not allow you to watch live NFL games while the NFL Game Pass in UK, Ireland, and Canada has blackouts. The International NFL Game Pass enables NFL fans around the world to watch the whole NFL season, including play-offs and the Super Bowl live without blackouts. Using Unlocator, you can sign up with the International NFL Game Pass in the US or Canada. Thus effectively bypassing NFL Game Pass blackouts on Android, Chromecast, iPad, iPhone, iPod, OS X, Ubuntu, Vista, Windows 10, Windows 7, Windows 8, Windows XP. Get your free Unlocator account. The US NFL Game Pass, previously known as NFL Game Rewind, only offers replays of NFL games which makes it useless if you want to watch your favorite NFL team live. By using Unlocator, you can subscribe to the International NFL Game Pass which offers the whole NFL season live. First, sign up with Unlocator for free. Next, follow the setup instructions for supported devices listed below. After you’ve configured Unlocator DNS on your device, head over to NFL Game Pass and sign up for an international account. You can choose the currency you wish to use for your transaction in the top right corner. 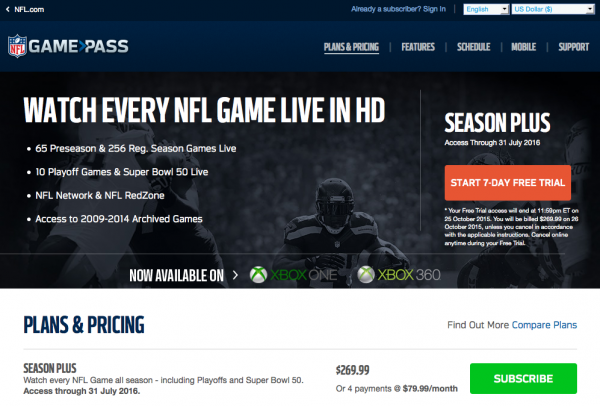 Using an American credit card and address during the NFL Game Pass sign up process is also possible. Please note that you cannot use your US NFL Game Pass account to log into the International NFL Game Pass. If you already own an International NFL Game Pass account, you do not have to create a new one.